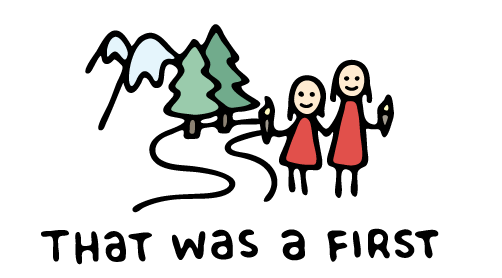 Adding firsts to your day through food, travel, and family fun! Is a trip to a Great Wolf Lodge water park looming in your family’s future? Did the kids see the commercials on tv and now think it’s the best place in the world, while all you see is the money flying out of your wallet? After a while, you start to realize that it does look like a lot of fun. Then you secretly picture yourself racing down those water park slides, and start to wonder if a stay there can be within your budget? Yes, it can be an expensive place to visit, but there are ways to save money at Great Wolf Lodge. With just a little planning and strategy you can say “yes” when your kids start begging to go to Great Wolf Lodge. So what’s the strategy? The answer is these 16 easy ways to save money at Great Wolf Lodge. Go to the Great Wolf Lodge website and sign up for their emails. The lodging deals will appear right in your inbox. Read the fine print because some deals are only available on certain dates or room types. If you don’t want any more email in your inbox, then check out the “special offers” tab on the Great Wolf Lodge website. There are usually a few offers to choose from. 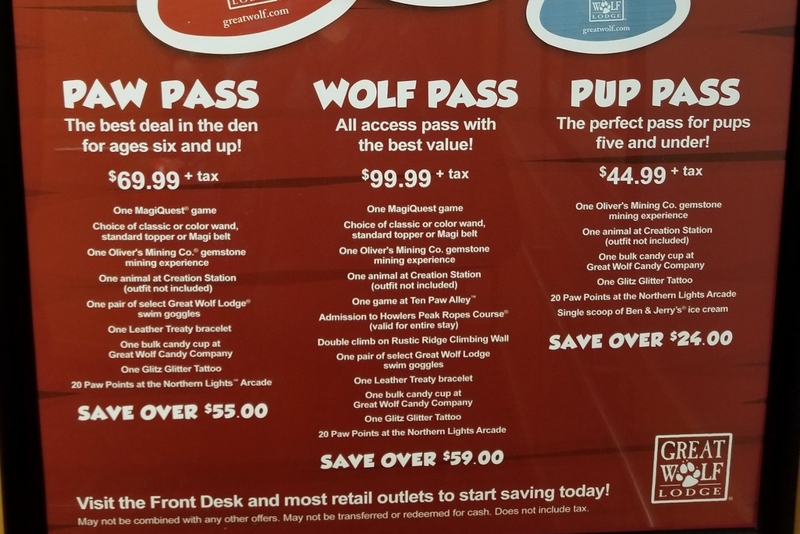 Sometimes there are great deals offered on Groupon for certain Great Wolf Lodge locations. Do a quick search before you book your trip. On our first trip to Great Wolf Lodge, I got my room discount code by searching “Great Wolf Lodge promo code” on Google. I got a better deal than any promotions that were in my email or on the website. Great Wolf Lodge has themed rooms and regular rooms. Of course, themed rooms are more expensive and probably not necessary. You aren’t in the room that much anyways! 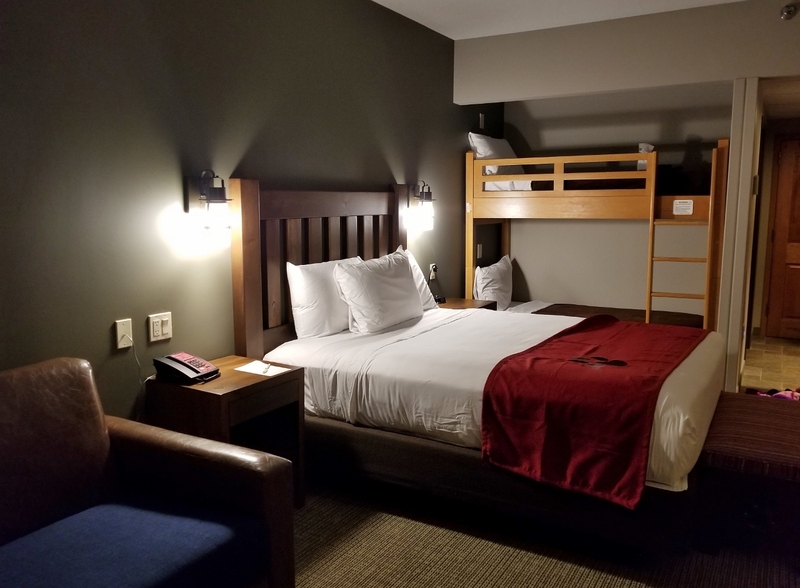 We booked a regular room that had bunk beds, and that was a fun treat for the kids without the extra cost. Book your stay for during the week. The rates are lower and the park won’t be as crowded. The charge on your credit card is coded as “lodging”, so if you have a credit card that offers a credit on travel charges…now is the time to use it. If you are planning a trip with a group of people, it may make more sense to get a larger room instead of smaller rooms for everyone. Do the math and decide if it’s worth sharing your space with others. Bring your own breakfast. There is a fridge and microwave in the room and a lot of cabinet and counter space for food. Suggestions are instant oatmeal packets, fruit, milk and cereal, or yogurt and granola. You want something that will keep everyone filled up for a while. Eating breakfast in the room also saves you some time in the mornings because you want to get to the water park right at opening. Get to the water park right when it opens to get a head start on the fun! Great Wolf Lodges are usually located among many fun family restaurants. I would suggest eating out for dinner. You may not save a lot of money by doing this, but the food will probably be better! 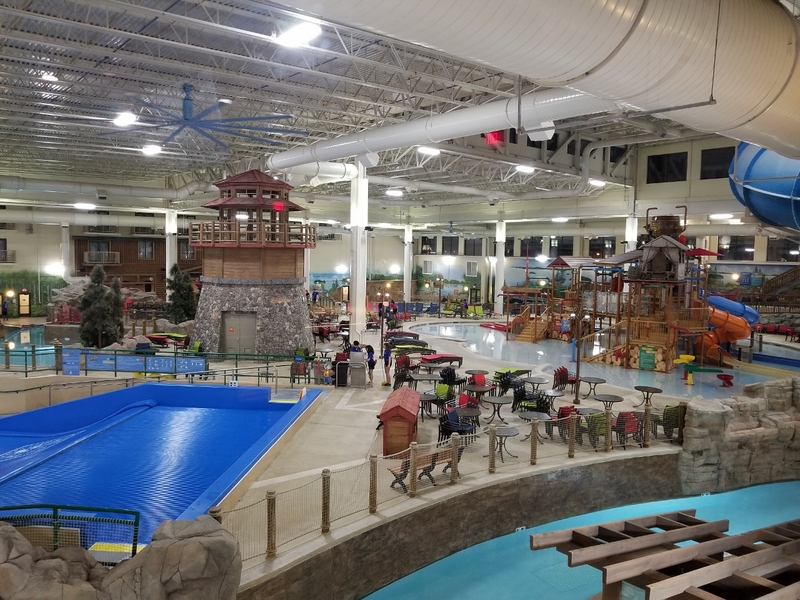 The Great Wolf Lodge in Bloomington, Minnesota is less than a mile from the Mall of America, and you can imagine how many restaurants they have to choose from…maybe try someplace new! Inside the water park, you will spot the very popular Coca-Cola freestyle machines. My kids were excited to get some soda, until we found out you could only use the freestyle machines with a special cup. That cup cost $14, but could be re-filled throughout your stay. After the initial price shock, I realized that this is actually a good deal if you have a couple of kids who will share the cups. The only downfall is the large amount of soda that may be consumed! There are a lot of fun activities for the family to do at Great Wolf Lodge. You actually don’t even need to stay there to visit the arcade area, restaurants, or play MagiQuest. They offer 3 different bundled packages that will save you some money on the various activities. Read thru your options and figure out what is best for your family. The bundled activities at Great Wolf Lodge can help you save some money. To make the most of your stay, arrive early and stay late. You can access the water park before the check in time on your arrival day. You can also stay late after you check out. There are locker rooms in the water park for your things. Set a souvenir and activity budget before you leave. If your kids are old enough, let them know how much you will spend on things. This may be the perfect time for them to break into their piggy bank and bring some of their own spending money. About one week before your check-in, you will receive an email with coupons. The coupons are for items at the gift shop, spa, or candy store. Print the coupons and bring them along just in case you need them! 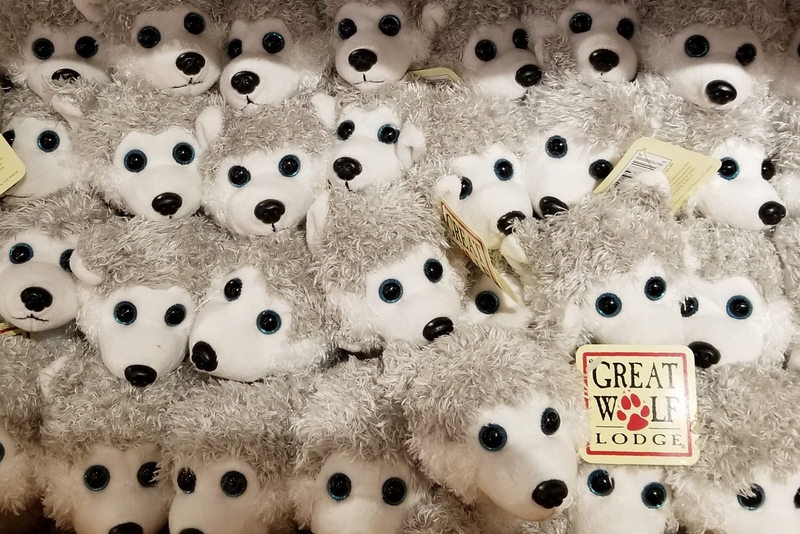 If you have little kids, they will no doubt fall in love with the stuffed wolves and other animals in the gift shop. Pick up a cheaper version ahead of time and secretly place it on their beds for a fun surprise. Super cute doesn’t have to mean super expensive! 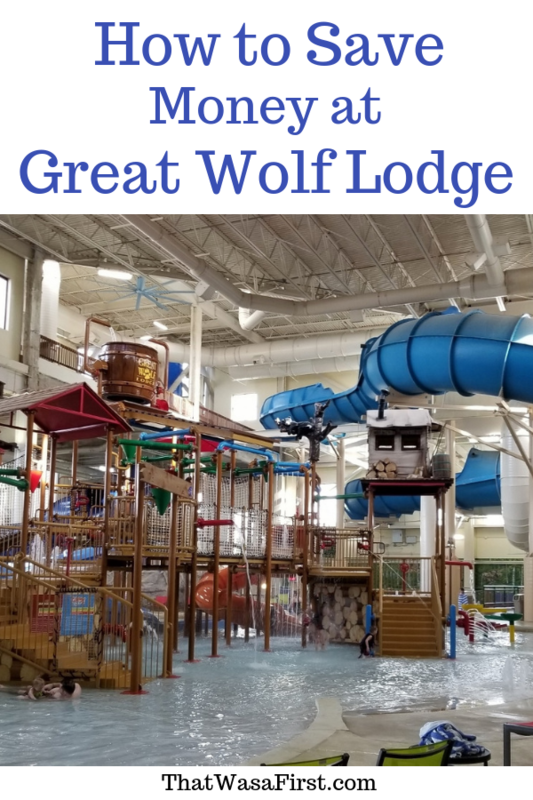 Bonus tip for your second trip…once you get home from your first stay, check your email and you will find a thank you and a discount for your next stay from Great Wolf Lodge. Really? Will the family want to go again? Yep, you will! Hey! This Holiday Inn has a Water Park! Great Wolf Lodge is opening in our Chicago area soon. Super excited! And I’ll definitely need these tips! We might need to take a little road trip to Chicago and check it out! Have fun! 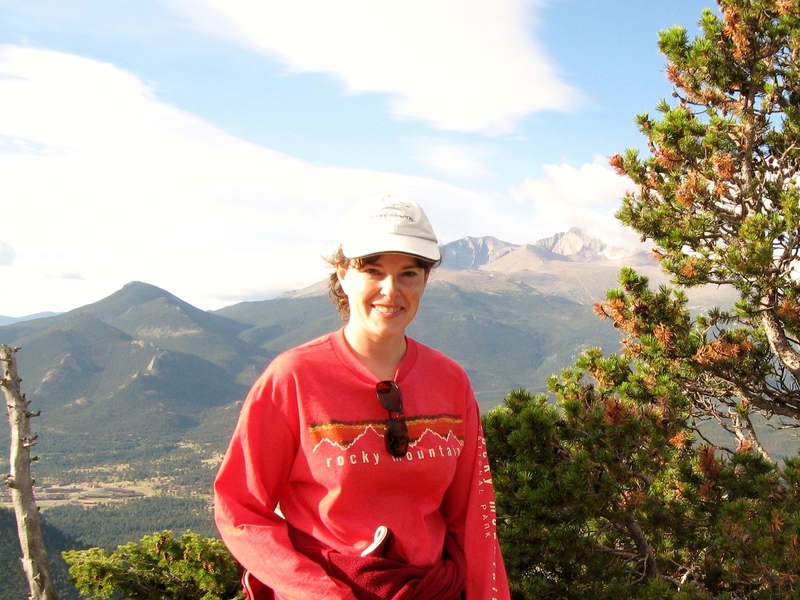 Are you a last minute planner and suitcase packer? Thank you! Watch your inbox for your free checklist! Subscribe to our newsletter and receive a free checklist to organize what needs to be done the last month before your trip! A relaxing start to your vacation is guaranteed!